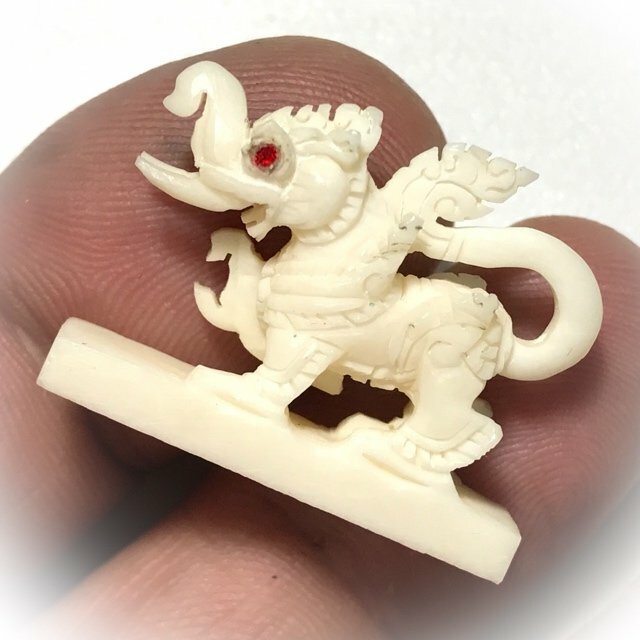 A most pristinely carved piece of high artisanry in sacred Ivory in high level of detail with red eyes, the Sacred Kochasri Elephant-Singha Himapant Animal with Red Ploi Sek Enchanted Gemstone Eyes, for Protection, Status, Invincibility, Commanding Power and Prosperity, from the Great Olden Days Master Luang Por Horm of Wat Chak Hmak, top master of the mid 20th Century (2433 - 2520 BE). An exceptionally welll crafted exhibit. 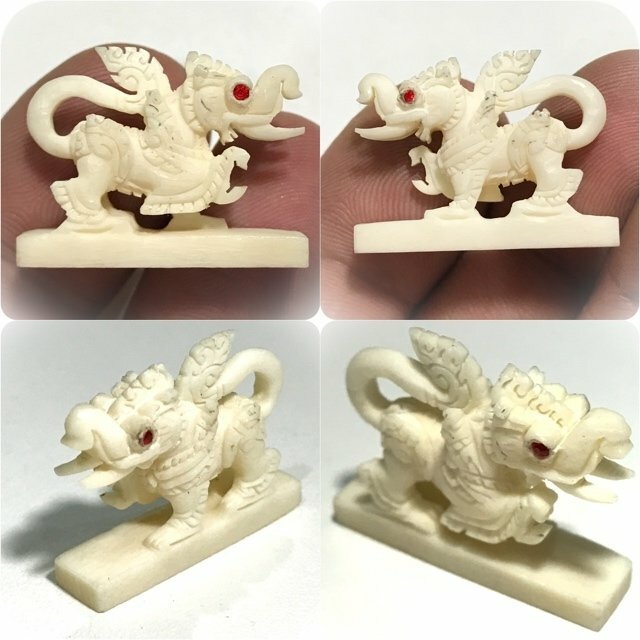 The amulet comes with Free EMS Shipping included. 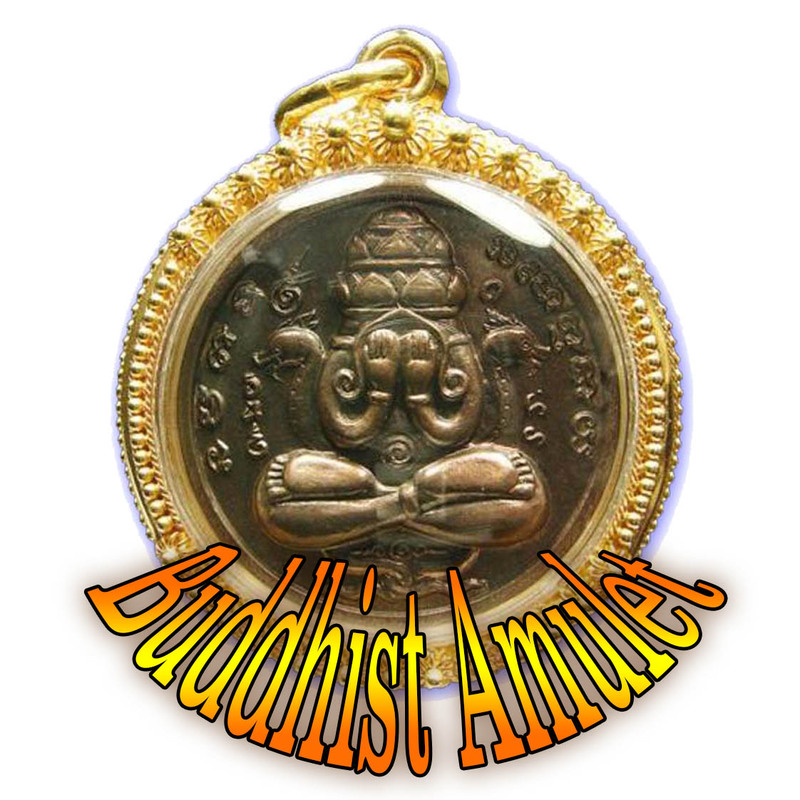 In the present era more than 2500 years after the passing of the Buddha, we still find the teachings available, and there are still truly attained practitioners, within the large fold of other monks who have not yet attained special powers, there have always been a few monks who have exelled in their practices and attained the Abijna Powers. It is said the Luang Por Horm was one of these special attained Masters, who was in his time, much more famous than many other monks of the time in the province, who have more famous names in the present day (such as Luang Phu Tim Issarigo of Wat Laharn Rai). The amulet is made from carved Ivory, and is carved in the image of a Kochasri Himapant Lion with Elephant Head, which represents various aspects of Maha Amnaj, Metta, Klaew Klaad, and Maha Pokasap Cornucopia Magic. 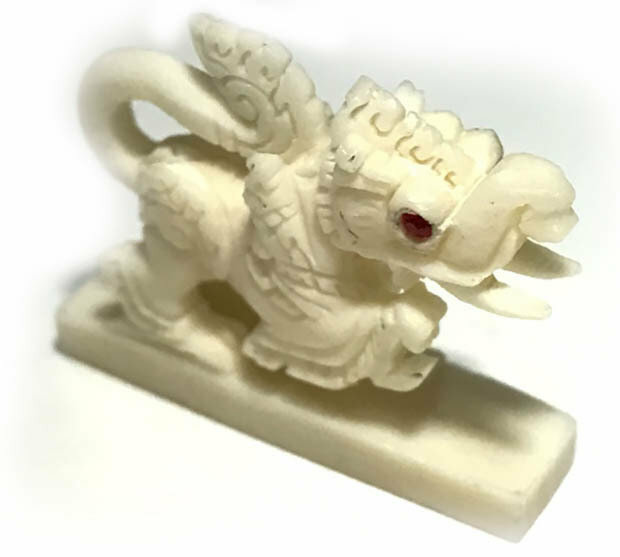 The Kochasri Lion itself, especially when carved from Ivory, is naturally imbued with the Sorcerous Powers of Maha Amnaj (commanding power and influence), Serm Yos Status Increase for positions of command, and opportunities of promotion, and Metta Mahaniyom Mercy Charm to lull your Subjects and Charm them into Obedience. Maha Pokasap treasure Accumulation and Cornucopia of Requisites is also Imbued. 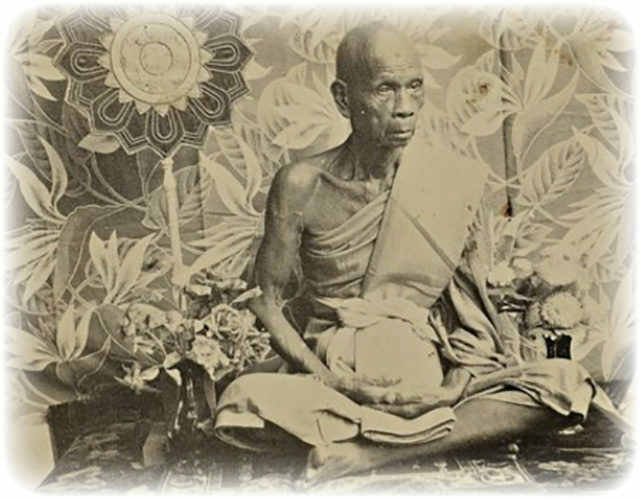 Amongst all of these Masters, Luang Por Horm was given the comparison to the be like the white elephant of Siam, and who was a monk whose temple was very small on the shores of the eastern coast of the gulf of Central Thailand, for his powers and attainments gained him great fame amongst his devotees and respect from his peers in the Sangha. Luang Por Horm was invited by the Sangha to almost every important Buddha Abhiseka blessing ceremony and religious ceremony, around the country, for his great abilities, and was seen present in some of the most sacred and important blessing ceremonies in Thai History. He would only be absent when ill, or had other duties to perform on the same date, otherwise would always conced to travel and assist in empowerment rituals. 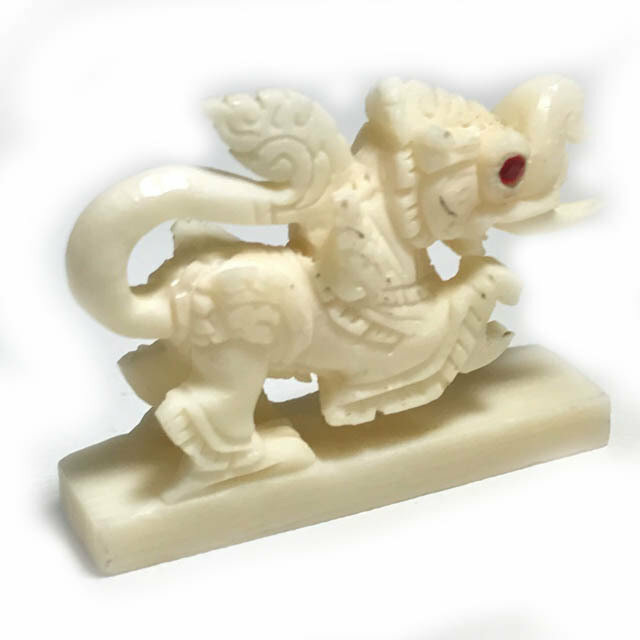 His presence was always asked for because the devotees in Thailand believe very strongly in the Abijna powers of LP Horm, and so any edition blessed by him in solo or in unison is highly revered by the devotee for its powerful Buddha Magic. 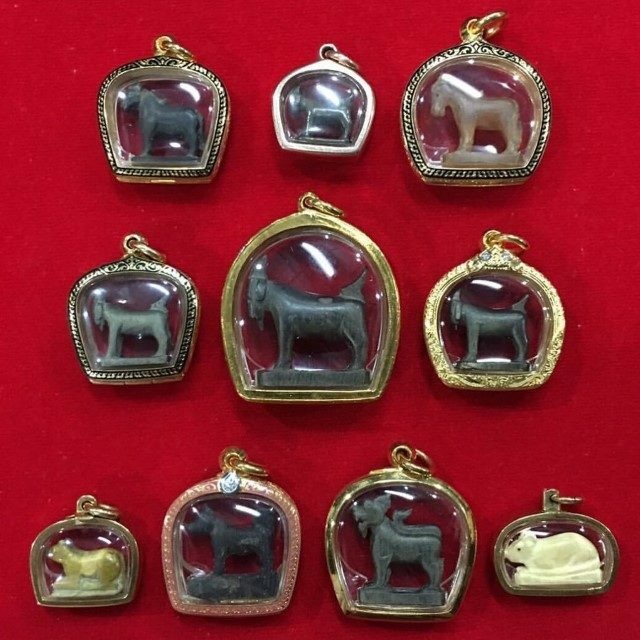 When speaking of the amulets which Luang Por Horm made himself for his own temple, the pantheon is extensive, ranging from talismanic amulets such as See Pheung Wax Potions, Singh Nga Chang Ivory Himapant Lions, Singh Gae carved wooden Himapant Lions, Sai Mongkol fishtrap money catchers, Pra Kring Roop Muean Loi Ongk Statuettes, Hnaeb Roop Muean Blazer Pins with image of Luang Por Horm, Cavred Ivory and Wooden Nang Kwak, and Buddhist amulets such as the Rian Roop Muean Guru Monk Coins, Hwaen Tong Daeng Roop Muean copper magic rings with image of LP Horm, Lockets, Pha Yant, Suea Yant shirts, and Takrut Amulets. 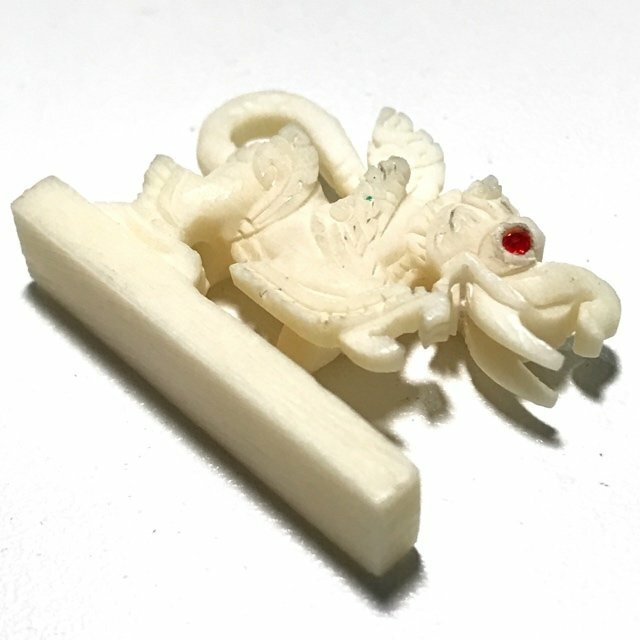 In the year 2500 BE, the government decided to instate an official national celebration of 25 Centuries of Buddhism, with the greatest blessing ceremonies of amulets in world history of Buddhism. 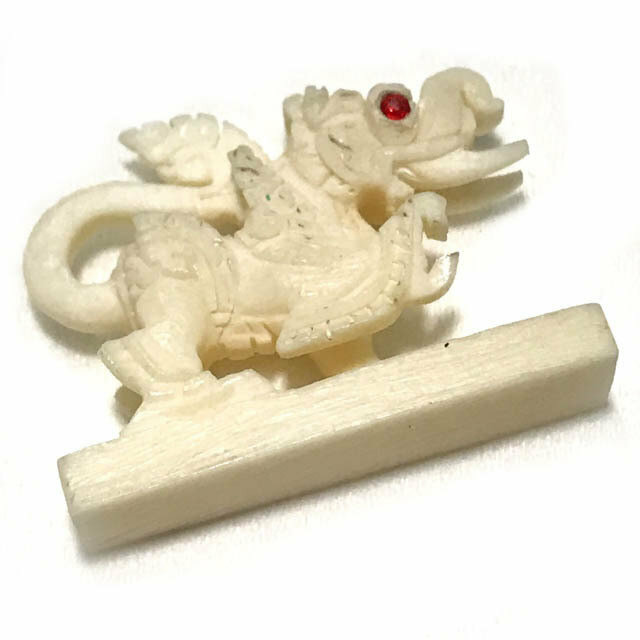 Many Masters and Temples were invited to submit their amulets for inclusion in the grand blessing ceremonies which were to take place. Luang Por Horm was one of the various great Master Monks invited to contribute, selected as one of 108 of the most powerful Monks in the country, under invitation of the King and the Government. After the ceremony, Luang Por Horm spent some time at Wat Sutat to rest, but many devotees from the Grand ceremony of 25 Centuries of Buddhism followed to Wat Sutat to beseech his blessings and amulets. LP Horm was merciful and generous and came out every day to distribute and spent the days giving blessings instead of getting some rest, until one of the overseers of the temple asked the devotees to let Luang Por Horm rest a bit. 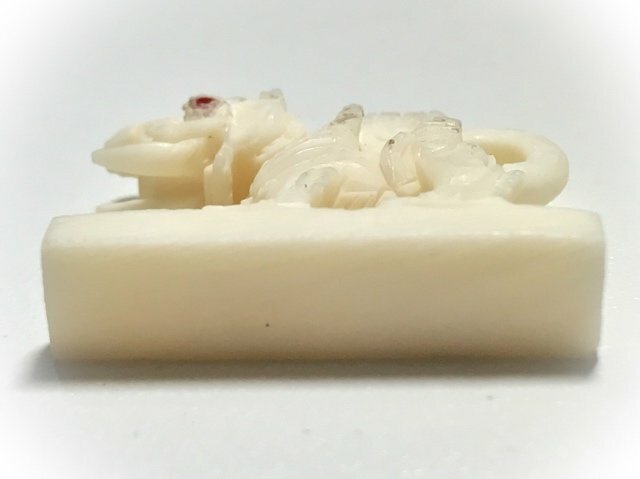 But Luang Por Horm used the word 'Chang Khao Teu Look' (never mind my son), and continued to bless and empower and distribute his amulets to the devotees during his stay. Luang Por Horm remained as tireless and merciful throughout his whole ordained life, and gained the love and respect of his devotees, not only for his Mercifulness, but also for his Immensely Powerful Magical Powers. The Kata Brings Klaew Klaad Kong Grapan and Maha Amnaj Serm Yos Imposing Commanding Power and Influence/Status Increase. Once Luang Por Horm had found and selected the trees to use for the wood to build and restore the temple, he called the local devotees and villagers to help bring the wooden tree trunks down the mountain to the temple. But when they villagers tried to achieve this goal, they found the forest too thick and impossible to get the tree trunks down the mountain, and gave up for the day. The next morning, Luang Por Horm walked towards the foot of the mountain to try to find the right pathway to drag the wooden tree trunks down, but, as he arrived at the permimeter of the forest near the temple, he saw all the wood they had collected piled up at the bottom of the mountain. Around the wood piles, were many elephant footprints. Luang Por Horm then said that this was the handiwork of seven elephants he had made friend with during his time in the cave, and that they had helped to bring the wood down Khao Nang Hyong Mountain for Luang Por Horm. This was the first documented miraculous event of Luang Por Horm, but not the last. Since that moment, the devotees of the area gained immense faith in Luang Por Horm's Miraculous Power, and his Diligent and Kind Efforts to Build the Temple being a sing of selflessness and tireless practice of Metta. When Luang Por Horm began to build the Uposatha Shrineroom (equivalent of a chapel), during the time of construction, another event occurred, as the local farmers turned up to recount that the wild elephants had come down from the hills and had begun to eat up all the fruits and vegetables in the farm fields. The devotees begged Luang Por Horm to help them, and Luang Por Horm conceded, and walked over to another place apart from the devotees, and began to pray and chant in front of the Uposatha Building he was constructing, calling upon his merits of construction to perform a Miracle. He then shouted out loudly "Look Hlaan paya Chattandt Yaa Hai Hyiab Yam Rai Khong Khao Leuy" (Descendants of the Grea Paya Chattandt, who was a past life of the Lord Buddha, Don't step on and destroy the farms of these Buddhist people). Thereafter, the elephants never bothered the farmers or their crops again, and indeed, the fruits and vegetables returned and grew faster and more than before, improving the prosperity of the farmers. This second Miraculous event further increased the faith of the Devotees in Luang Por Horm's special abilities with Metta Magic, and Protective Magic. 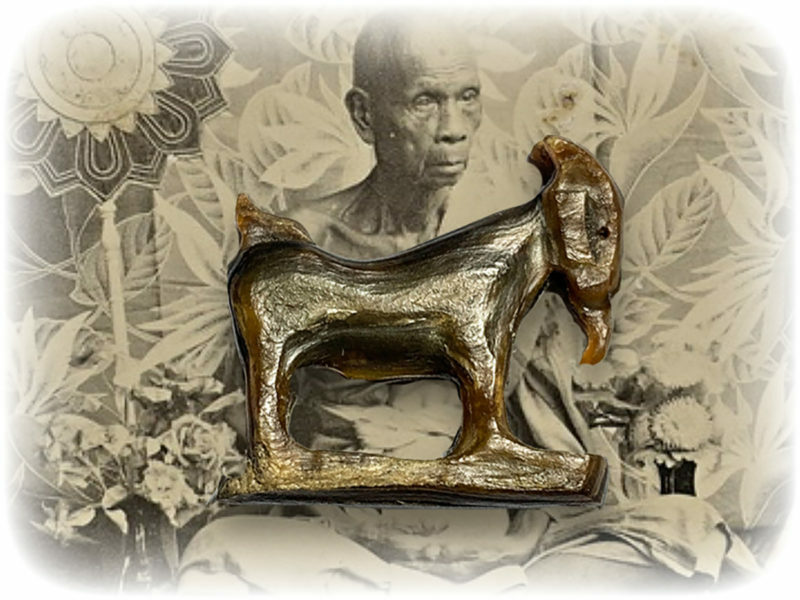 Another time that is recorded historically about Luang Por Horm, is that around the year 2481 BE, as Luang Por Horm was into his 12th year as an Ordained Bhikkhu (Monk), an elephant herder from the jungle came to ask if he could stay one night at the temple to rest for a while, so he could go into the jungle nearby and hunt elephants. Luang Por Horm allowed the hunter to sleep the night in the safety of the temple enclave, but in the night went over to the Uposatha Shrineroom he was building once more and called upon the merits of his efforts to assist, and Chanted "Look Hlaan Paya Chattandt Tang Hlaay, Wan Nee Yaa Awk Bai Haa Kin Glai Wat Sak Keun Gorn" (Descendants of the Grea Paya Chattandt, who was a past life of the Lord Buddha, Don't come out to seek food outside of the temple tomorrow or the next day, as there is a hunter who will shoot and kill you in the area). The next day as the hunter went out into the jungle to hunt, it seemed that he was unable to find even a trace of a single elephant in the area, because all of the elephants had come down from the mountain and entered the temple enclave, and were being fed there. So because it is forbidden to kill animals in a temple, the Hunter was foiled, and went on his way. Luang Por Horm told the monks to set up their 'Glod' umbrellas with mosquito nets and he then walked around each one and sprinkled some Sai Sek enchanted sand grains in a circle around each of the monks' meditation parasol-nets, and laid some hay and grass out as feed for animals. He then instructed everybody to spend the night meditating the Metta Compassion and Merit sharing meditation to all animals. During the night, a horde of poisonous snakes, scorpions, and predatory animals came and wandered around the monks where they were meditating, and the floor was full of dangerous beasts, insects, snakes and the like. But not a single animal entered the meditation area of any monk, and all of them departed before sunrise without further incident. Luang Por Horm then took his Bhikkhus and continued on the journey, which was very mountainous, and they ended up passing two or three days without seeing a single human dwelling, and unable to beg for alms, and went without food. On the fourth day, a lay person came across them and offered alms of Khanom Jeen white fresh noodles to the monks. Once they had eaten, Luang Por Horm asked the traveler "when we continue this way, how long will it take to reach the next dwelling places where humans are living?" The traveler said 'As the darkness falls, you will see the lights of houses', and walked off into the forest. So Luang Por Horm then instructed the Monks under his Mentorship to set off again and continue the journey. Throughout many many hours not a single dwelling place was spotted, only thick Jungle, and darkness was beginning to fall, and the monks began to wonder who the traveler was who had offered the Khanom Jeen noodles and told them they would see house lights, because if the traveler was just a normal person, he could not have been so deep in the forest alone in that way. But as it because fully dark, indeed, the lights of a house became visible, and so Luang Por Horm told his Monks to make camp in the forest nearby to the households, so they could beg for alms. 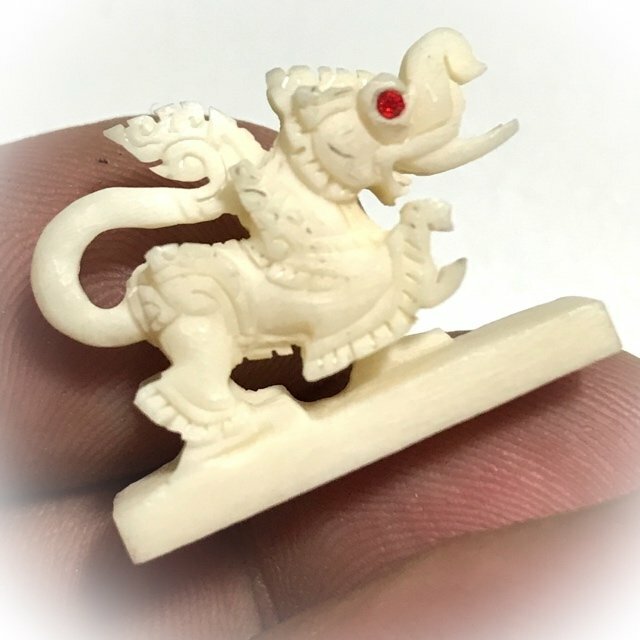 Once they had recovered, they traveled back to Wat Chak Hmak, without having found the Sacred Bai Kaprao Jet Om As to the strange traveler they had met on the fourth day who had given them food, he remained a mystery, and nobody has ever found out who it was. During the yearly celebrations of the temple, in the year of the making of the first edition Roop Lor Pra Kring of Luang Por Horm, a regiment of soldier came to the temple, and each of them rented a Roop Lor Pra Kring of Luang Por Horm. The soldiers then decided to take the amulets to the back of the temple behind the school building, and test the power of the amulets to be sure of their effectiveness. 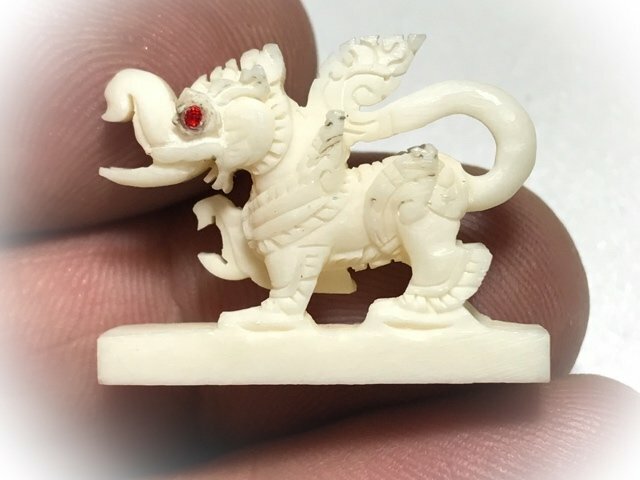 So they all took out their amulets and laid them out together, and took a .38 revolver to shoot at them for the test of Kong Grapan or Maha Ud, or Klaew Klaad. However many times they fired the gun, the bullets would not fire. But when they pointed the gun away from the amulets, it would shoot as usual (every bullet). The soldiers then ran back to the temple and spent all the rest of their money in donations to rent as many of the Pra Kring amulets as they could. 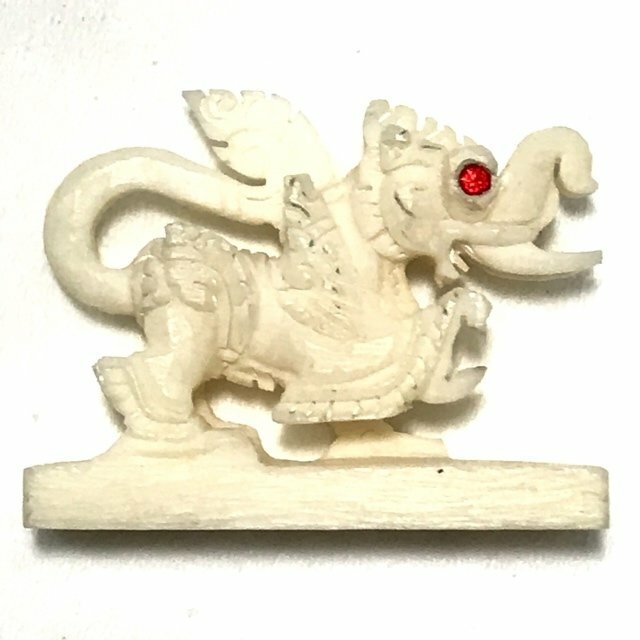 When they got back to the barracks they retold the story and all of the amulets were rented to the other soldiers, and since then, every time Luang Por Horm would have his yearly celebration and release amulets, the soldiers of this regiment would fill the temple awaiting his blessings and amulets. There was a time when all the newspapers around the country were reporting about a large group of gangs of teenagers and youth who were from bang Rak in Bangkok, who were fighting and having heavy casualties and deaths, but that there were some cases of people attacked with deadly weapons, who were completely and astonishingly unharmed. 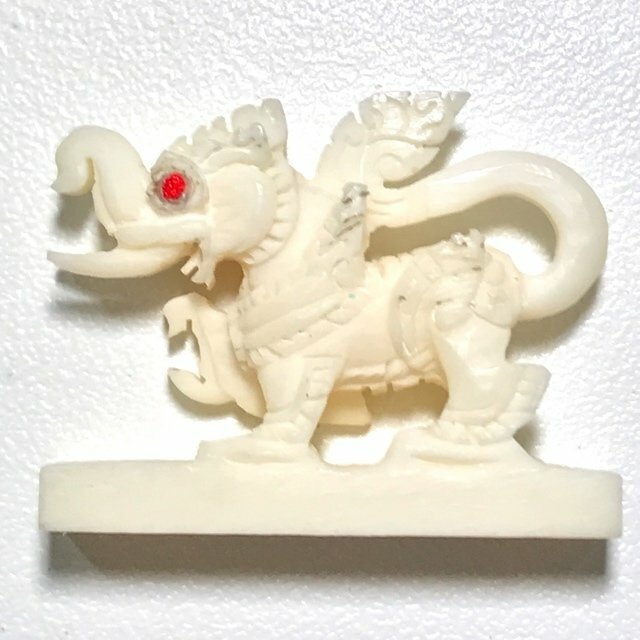 After further investigation, it turned out that every one of the people who had miraculously survived knife and gun attacks, all had worn the Singha Himapant Lion amulet of Luang Por Horm! So many of the youth thereafter flocked to the temple to beg Luang Por Horm for his Singha amulets, but Luang Por said "My Singha amulets are not for Hooligans, and from this day shall no longer protect the devotee who uses the amulet to protect himself whilst harming other innocent people", and he refused the hooligans. There was once a local chieftan called Mr Trai Trong of Samnak Torn Yai Municipality, who was traveling to Samut Prakarn with 8 of his assistants, and had an accident on the way, where the pickup flipped over and rolled many times, and was smashed like a concertina. A Policeman was nearby and saw it and ran over to look with the feeling that nobody could have survived, but to check if there were any survivors he could help get to hospital. As he arrived and checked, and the emergency services cut open the car wreck to help the survivors out, everyone was astonished to see that all the occupants were unhurt. This caused some confusion in the mind of the Policeman and he inquired as to how they had escaped death without a scratch. It turned out that all of the occupants were wearing the Singh Chang of Luang Por Horm (Ivory Singha Version). 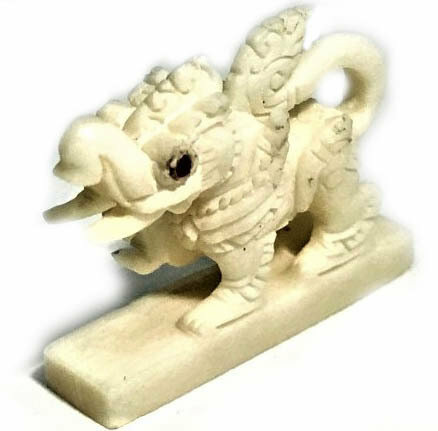 Another of Luang Por Horm's famous and inimitable abilities was the Wicha Garn Dtor Chadtaa Din, which was a highly required and popular magical spell needed by people of that time. This Wicha was based in assisting those whos property (earth), had lost its effectiveness and was rendering less prosperity than before, or become useless. No matter whether it was farmland with fruit, or a Business establishment, both are standing on the earth, and Luang Por would perform a ceremony of 'Fang Hin'(Bury a Magic Stone). After he would perform this ritual, people's businesses and farmland would return to normal and prosper even better than before. A lay devotee and student of Luang Por asked to learn this Wicha of changing the fate of earth from bad to good, but Luang Por said that the only person who can receive the Wicha has to ba an Ordained Monk who has promised to never disrobe. Luang Por Horm said that to ordain as a Monk is not something to take lightly, and that in truth, one should ordain and never disrobe, which is the only reason the Buddha himself would ordain a person. Luang Por Horm was also highly adept in healing methods, both spiritual, herbal, and scientific, because he had studied and mastered these subjects as a lay person before his ordination already. Usually at least 50 ill people would come to the temple every day for Luang Por to give his healing blessings and herbal medicines, and his level of success with healing raised him to become a Nationally Revered Monk for his adept abilities and great compassion to alleviate the sufferings of sentient beings. Luang Por Horm had devotees from around the world visiting him from China to America, Hong Kong to Singapore, and even Sikhs from India. When he passed away, his funeral and song nam ceremonies (cleaning the corpse) were always so overfilled with devotees that it took all day for the queues of faithful Buddhists to complete the ceremony.